You can turn to Qdoba catering for every meal of the day. Whether it’s a breakfast get-together, a working lunch, or an evening sports celebration, we’ve got you covered! Our catering needs only a 24 hour notice and comes with everything you need to enjoy the best Mexican eats around! Everyone loves a breakfast burrito. What other breakfast delivers protein to get you going, carbs to keep you going, and mouthful after mouthful of wake-you-up flavor? Our catered Breakfast Burrito lets you choose between two sizes, regular and large, as well as between the Steak Breakfast Burrito or the choice of the Chorizo, Bacon, or Chicken. All burritos come with eggs and new seasoned potatoes, three-cheese queso, and salsa. You can choose between Pico de Gallo, Salsa Verde, Salsa Rojo, or if you dare, the Fiery Habanero Salsa. For lunch or dinner, you have a whole catering menu to choose from. We offer a Hot Taco Bar, a Hot Nacho Bar, Hot Naked Burrito Bar, Boxed Lunches, and extra chips and salsa, drinks and desserts. We need just 24 hours notice to be ready to deliver your choice of meal to almost any location around Cheyenne, Laramie, or North Platte, though some locations will involve a delivery fee. We deliver everything you’ll need to keep the food warm, as well as everything to serve and eat it, including plates, cutlery, and napkins. 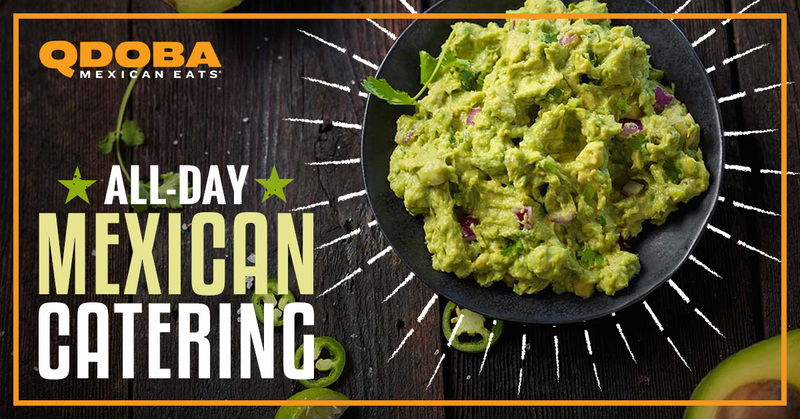 Call today to order your Mexican catering from Qdoba.